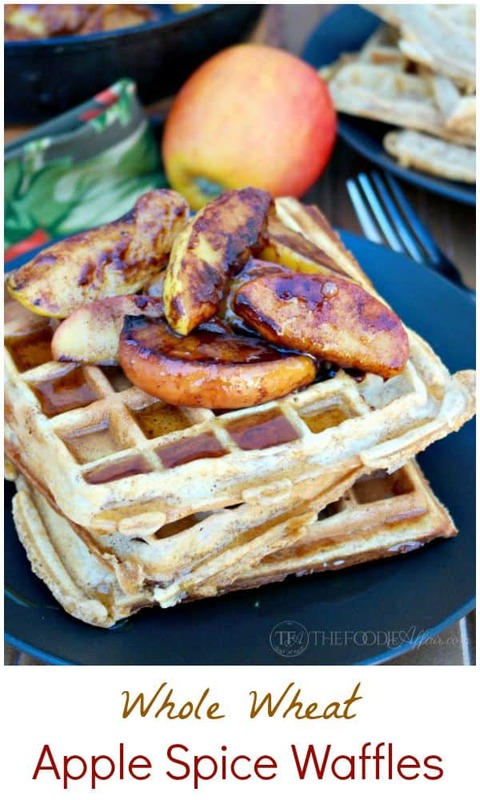 Apple Spice Waffles made with whole wheat and fresh grated apples topped with pan fried caramelized apples for a lovely breakfast or brunch! When I picked up Granny Smith apples for the Take 5 Apple Pie that I made this past weekend I also noticed another variety called Mutzu apples. They look similar to the Grannies, but the skin is a bit thicker. Other than that I had no clue if they were tart or sweet. That’s what I love about shopping at local produce stands or Farmer’s markets I find new (at least to me) fruits and vegetables to try and I’ll just go with whatever they have to offer. I learned (thank you Goggle) that the Mutsu apple originates from Japan and is a cross between the Golden Delicious and the Indo apple, which is another apple that I’ve never tried! Mutsu apples are crisp and juicy and are the perfect variety for baking. I sliced up two and pan fried them with butter and then added apple pie spice and brown sugar that caramelized the apples. 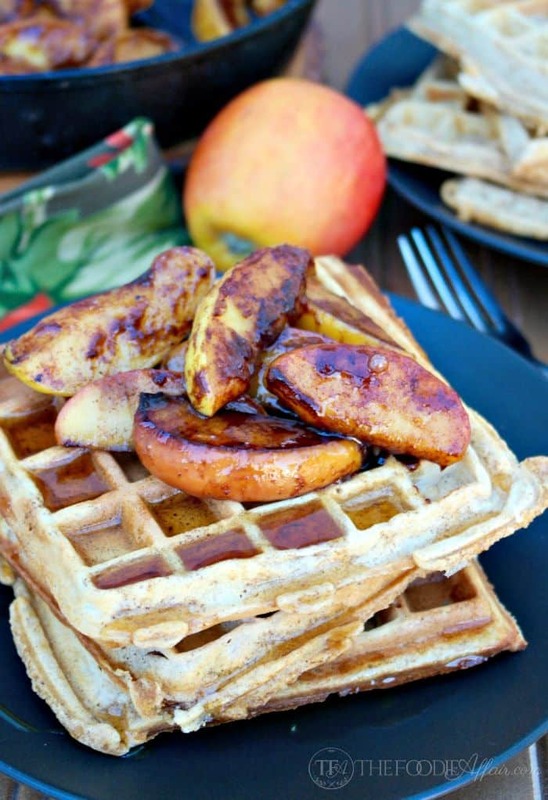 Delicious topping to these whole wheat waffles! The waffles also have grated apple in them, but I used a Fuji that was almost too soft to eat on its own, but perfect to add to the waffle batter. I based the waffles from my How to Freeze Waffles post, but instead of using part all-purpose flour I made the batch with whole white wheat and other delicious Fall spices. I really like the milder flavor of whole white wheat and continue to experiment with it. The Whole Grains Council Organization, describes whole white wheat as an albino wheat with the same nutritional value as traditional whole wheat. It’s also light and fluffy like all-purpose flour, so this stuff is pretty golden in my mind! 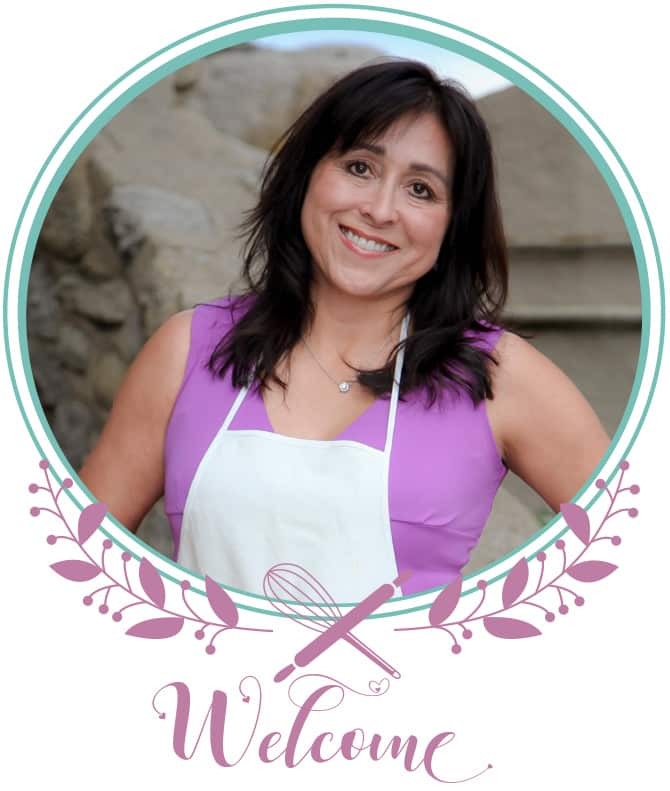 I hope you’ll have time this weekend to give these waffles a try! Keep an eye out for Mutsu apples too and snag them up! Do you have extra batter? Here are some tips on how to freeze waffles. If you want to try something more decadent, you’ll love these Whole Wheat Chocolate Waffles! In a medium bowl whisk together the flour with the baking soda, baking powder, salt, sugar, and apple pie spice. In a separate bowl, combine the eggs, butter and buttermilk. Add the egg mixture to the flour mixture and stir until combined. Fold in grated apples. Let the ingredients sit for 5 minutes. Cook according to your manufacture's recommendations. 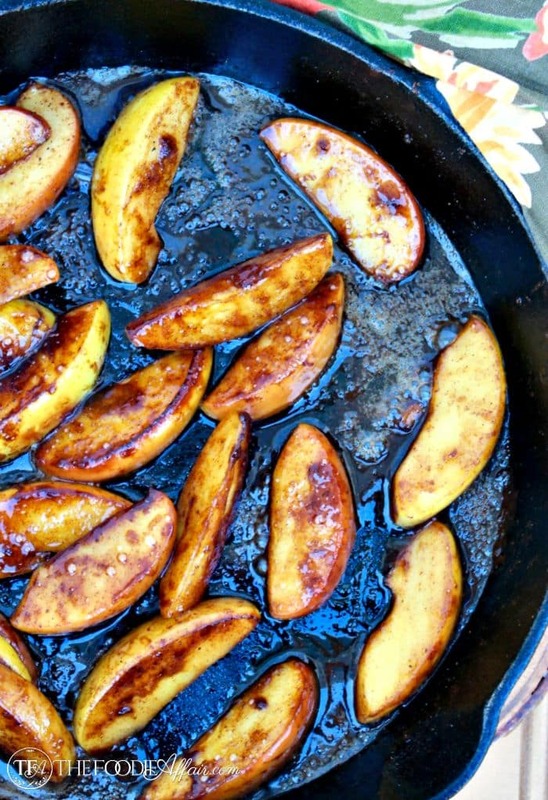 In a large skillet over medium heat melt butter and when it begins to sizzle add apples and cook for 2-3 minutes. In a separate bowl whisk together apple spice, cinnamon and brown sugar. Sprinkle over apples and fold until well coated. Add water and cook for another minute. Top on waffles. Serve with maple syrup. Apple topping is enough for four servings. Your apple topping would be luscious on so many things. Ice cream, yogurt, oatmeal. Just plain YUM! So many different ways to enjoy the apples! They’re so good! 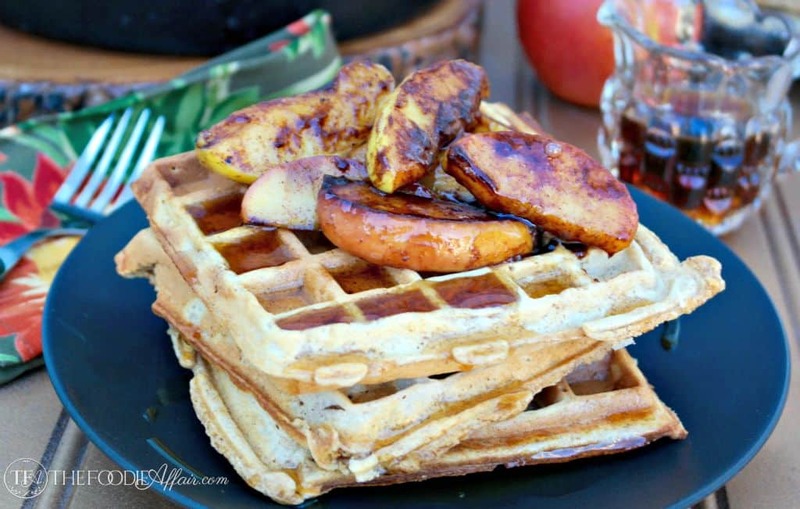 These waffles and that topping are perfect for fall!! Your waffles look like they would make a GREAT dessert. I love how you carmelized the apples too. It is apple season where I live – right in the middle of apple country. I’ve never heard of OR tried the Mutsu apple, but if I see them, will grab a few to test out! Oh, lucky you to have the fresh pickings right in town! I love waffles and these have the name fall written all over them! This looks so good! I love recipes like this! I love eating fresh fruit with waffles. I have some apple that I need to use up ASAP, so this would be a great recipe to try. You are so creative! I love the apples in the batter as well as on top. What a bonus to add the heavenly flavors of autumn! Thanks, Betsy! I’m ready for the leaves to fall and all the homey recipes that we enjoy during autumn. It’s a tasty duo for sure! Give Mutsu apples a try if you happen to see them! 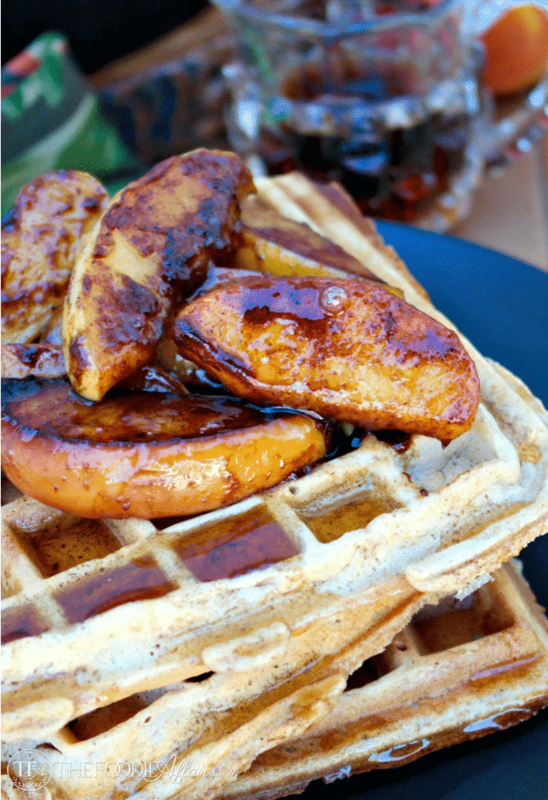 These waffles look so good, especially with the caramelized apples on top, perfect for a fall brunch! I have so many apples right now! We have several apple trees on our property 🙂 I will have to try this recipe for brunch soon! I am dying over these waffles! 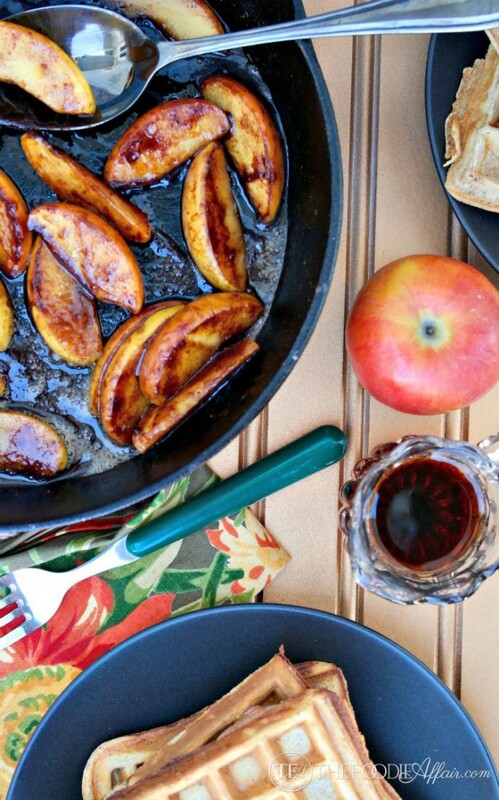 Those caramelized apples on top are definitely the clincher for me. 🙂 Looks amazing! Thanks, Carrie! Next time I’ll double the apples and eat them with other dishes too! 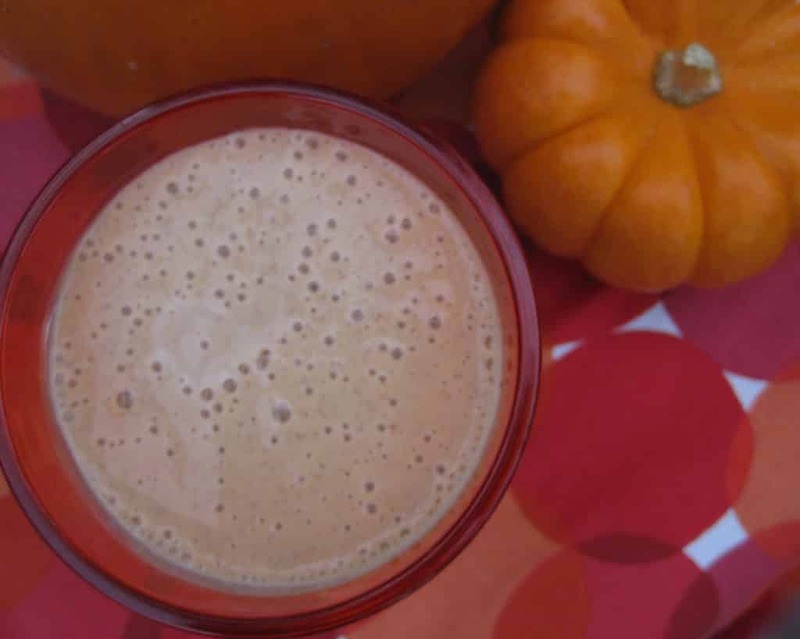 I seriously can’t think of a better way to enjoy my favorite Fall flavors! Wow, this looks amazing! Mouthwatering! I just want to steal a little apple off the top of your delicious stack of waffles but would not want to ruin your gorgeous photo. Pinning to some of my breakfast favorites!